Sunburn, tanning, premature ageing and eye damage. We all know how to protect ourselves from the sun and its Ultraviolet (UV) radiation. But have you heard about the harmful effects of blue light rays? Googling, posting on social media, texting, looking at pictures, reading e-mails, watching series, working … Our time in front of digital screens had increased over the last years and with it, our exposal to the blue light. Nowadays we can spend more than 6 hours a day in front of digital devices. 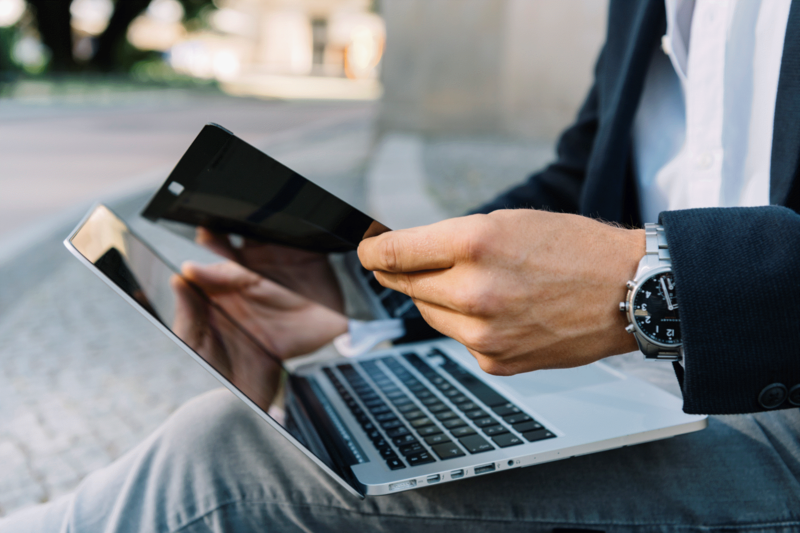 Blue light is everywhere, but when it comes to artificial sources of light, such as smartphones, tablets, laptops and other big screens, we should take care of it. As you may know, blue light is a range of the visible spectrum (see below 'The light spectrum'). Blue light is defined as having a short wavelength, meaning that is a type of high-energy visible light in the violet /blue band from 380 to 500 nm (nanometer) in the visible spectrum. Wavelengths are measured in nanometers (nm). 1 nanometer equals 1 billionth of a meter. 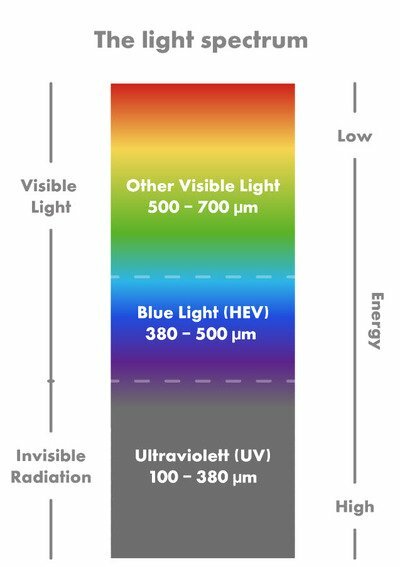 Approximately one-third of all visible lights is considered high-energy visible (HEV) or blue light. All lights pass through the cornea and lens and reach the retina. But when the blue light does, it leads to a production of free radicals, which induces the death of pigmented cells from the retinal pigment epithelium (RPE) by oxidative stress. Being exposed for long periods of time over the years can result in severe cell damage. DICOTA privacy filters (Secret 2-Way and Secret 4-Way) reduce the amount of blue light emitted by 42.2% up to 48.1%* the amount of blue light emitted without compromising the image quality of your devices. Moreover, contrasts are improved by reducing screen brightness, flickering and eye fatigue to provide a strain-free visual experience while providing the most complete protection. In the colour spectrum chart above, you observe in grey the performance of the blue light wavelength from an LCD display. Blue light emission from liquid-crystal displays (LCD) appears normally in a range of 400~500nm. However, the most harmful blue light emission is from LCD is 440~470nm. 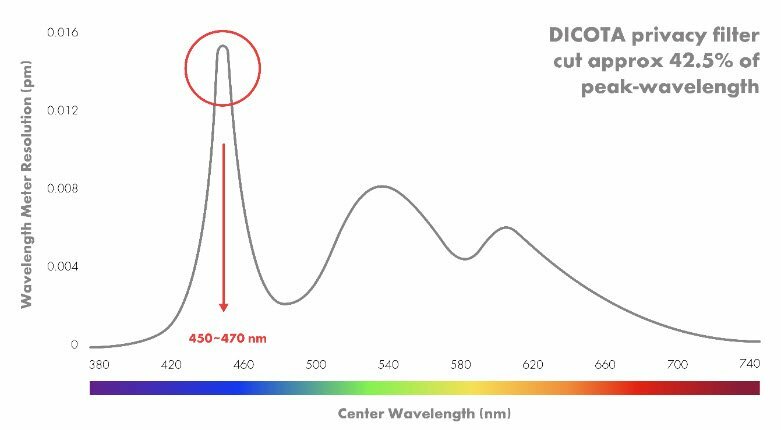 The blue light cutting function from the DICOTA privacy filters reduces approximately 42,5% of the peak-wavelength in average from 430~470nm. When working for extended periods of time, reduction of blue light from our filters will increase your comfort and at the same time, will protect your eyes from increasing the risk of macular degeneration and early vision loss. Now that you learn how positive is for you the blue light cutting from our filters, discover the wide range available at www.dicota.com and find the best data privacy and blue light cutting solution for your device. *Based on the measurement of test results.